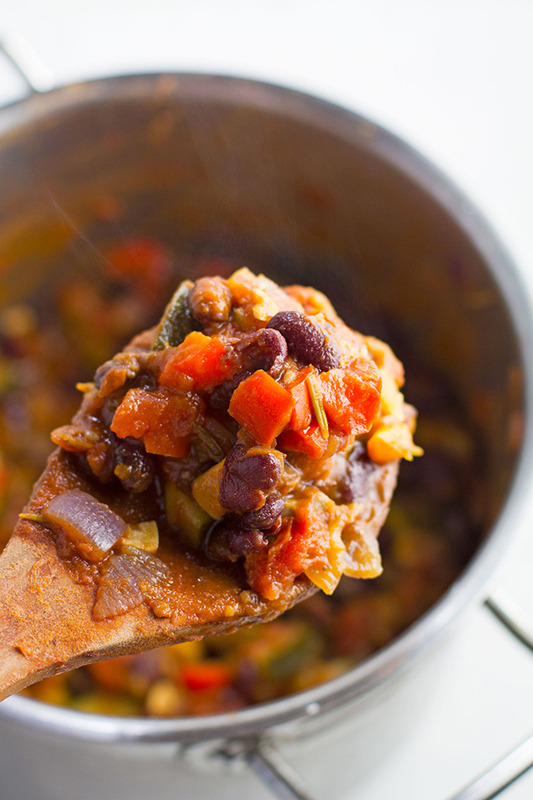 You are not going to able to stop eating this protein packed Red Kidney Bean Ratatouille once you make it. It is exploding with deliciousness and is so super healthy. Today I give you what could possibly be the best and tastiest ratatouille recipe that I have ever eaten. That is why I am sharing it with you all today….cause I need you guys to get a little bit of this amazing goodness in your life asap. We are talking about a slightly different styled ratatouille recipe though. Kinda like the classic but packed with way more flavor and way more protein than the original. Making it an excellent dish for all you vegos and vegans out there. Plus if you are gluten, diary or egg intolerant then this dish will be right up your alley also. So the usual suspects are still hanging around in my twisted variation. Chunky dices of sweet red onion, a combination of red and yellow bell peppers and zucchini with lots of sliced garlic. Then there is the tomato based sauce that these guys hang out in that is perfectly seasoned with brown sugar, salt and pepper. Oh yeah, and a good generous splash of white wine. And then there are the new guys. The guys that take this ratatouille to the next level. They aren’t flash or unusual or exotic. But man, I tell you what, together with the old gang they make this dish incredible. 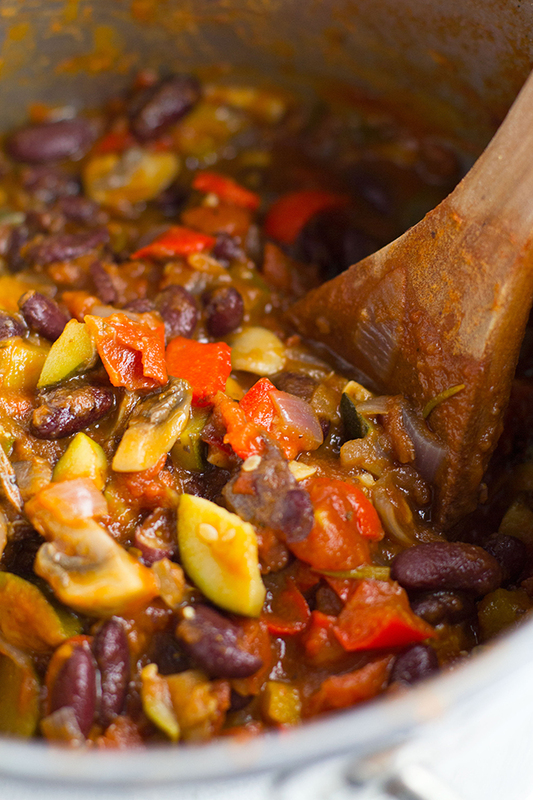 Let me introduce you to chunky cut mushrooms, herbaceous rosemary and protein packed red kidney beans. The mushrooms are a great alternative to the usual use of eggplant in this dish. They bring the same kind of texture but give an added punch of iron to this vegan styled recipe. Rosemary is definitely the herb of the month at the moment, being the festive season and all that. But I truly love the flavor that it gives to this dish, it just suits it so well. You guys are going to love it, trust me. Then there are the red kidney beans. The addition of these red fellas takes this ratatouille from beyond a side dish to the main event. They add so much goodness, with health benefits that include a high fibre content that helps to not only lower blood sugar levels but also cholesterol levels. They have a high level of folate and magnesium for good heart health and also contain good levels of thiamin, which helps your memory and manganese for antioxidant defence. They contain slow burning carbs and increase your energy levels by raising your iron stores. Plus they have an excellent amount of protein and are low in calories, virtually fat free in fact making them super good for you especially in the weight loss department. And they are the perfect bean for this dish cause they just soak up all the flavors that this ratatouille has to give. And although the time to make this Red Kidney Bean Ratatouille might be a bit lengthy, the prep and difficulty level is pretty minimal. Other than chopping all the veg up and doing the original cook down, the rest of the time you can just let it sit there on the stove, simmering away with only the occasional stir needed. 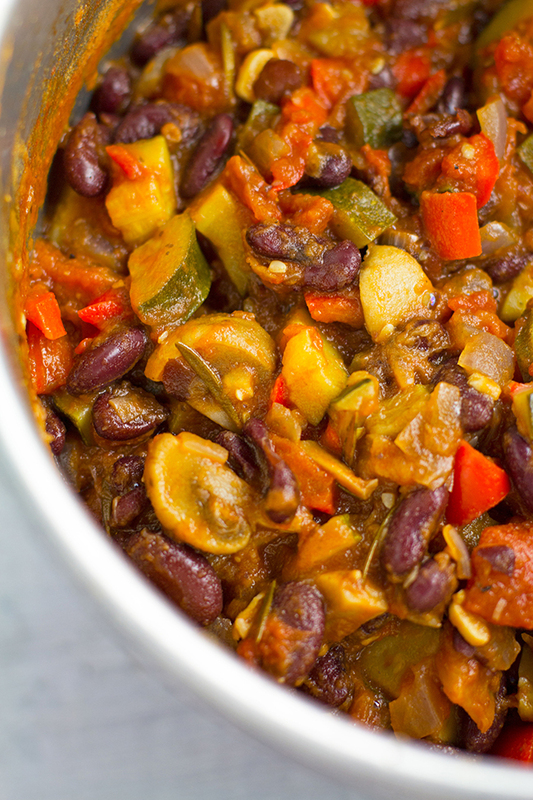 Like I mentioned before, this Red Kidney Bean Ratatouille is good enough to be eaten as a main meal but it also makes an excellent side dish to share. So far I have enjoyed this ratatouille on crusty bread, making it into a kinda bruschetta. As a bed for homemade baked meatballs, as a pasta sauce and on top of potato fritters, which are deep fried battered potatoes. But I can also see this dish being served with a bed of brown rice or quinoa or along side a roast lamb. But really with a versatile dish like this the options are endless. I do hope you try this and let me now if you do by leaving a comment below. I really do love hearing about your culinary adventures. In a large saucepan heat oil over medium high heat on stove top. 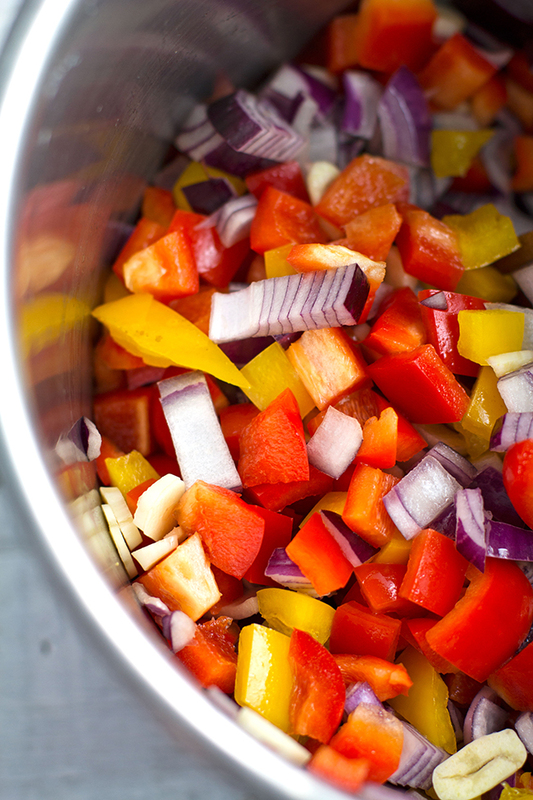 Add onion, bell peppers and garlic and cook for 5-6 minutes stirring constantly. Add zucchini and mushroom and cook for a further 10 minutes. Slowly add white wine and cook for a further 5- 10 minutes till reduced. Add tins of tomatoes, rosemary, sugar and season. Stir well to combine and taste to check seasoning. Cook for a further 35-40 minutes or until liquid is reduced. Stirring every 10 minutes or so. Eat immediately or let it cool before placing in fridge.